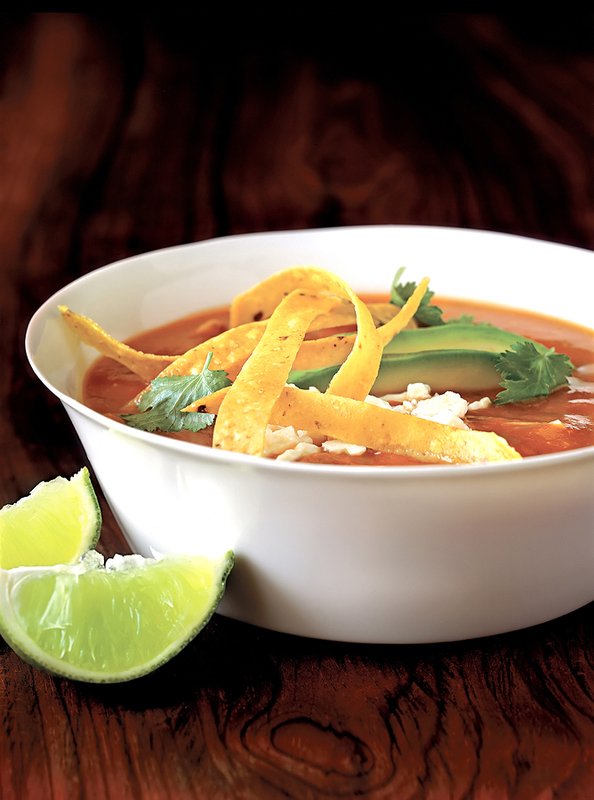 Tortilla Soup with Spicy Crisps | Relish! This easy chicken tortilla soup recipe is the perfect healthy one pot Mexican meal. Bring a medium pot of water to a boil. Drop in the chicken breasts and boil for 15 minutes or until the chicken is cooked through. Drain chicken in colander and let cool. Remove skin and shred or cube the meat. Heat a large skillet over medium heat. Add olive oil and sauté onion and garlic in oil. Pour into the medium pot you used for chicken. Add beef and chicken broth, tomato sauce, cumin, chili powder, jalapeño (to taste), salt, Worcestershire sauce, tomatoes and chicken. Bring to boil, cover and simmer for 30 minutes. In the skillet, heat the canola oil until hot. Cut tortillas in narrow strips and fry. Sprinkle with salt and a little chili powder. When done, place on paper towels. Place half of the strips in bowls. Fill with the hot soup. Garnish with more tortilla strips, avocado slices, cheese and lime wedges.